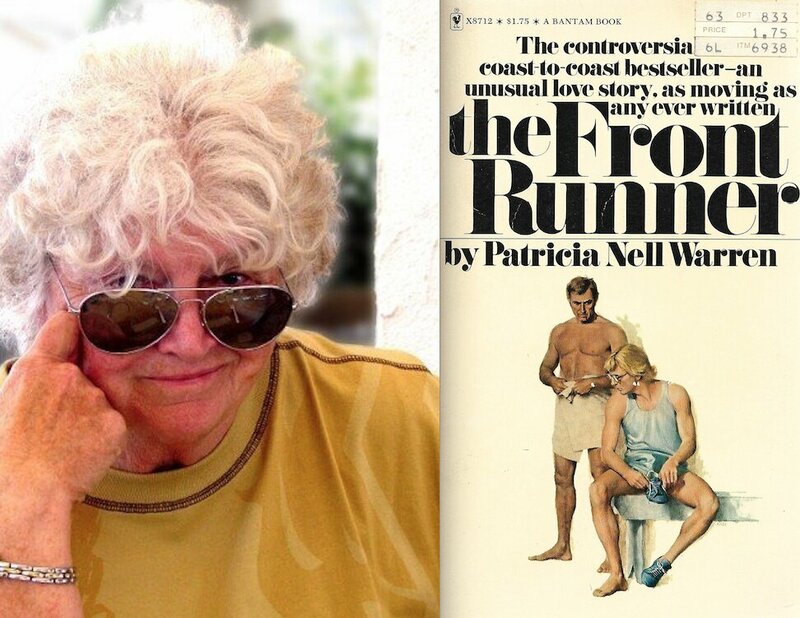 Boy Culture reports that The Front Runner (1974) author Patricia Nell Warren died Saturday at 82. Born in Helena, Montana, on June 15, 1936, Warren wrote from her earliest years and was the winner of the Atlantic Monthy College Fiction Contest. Through an early marriage to Ukrainian poet Yuriy Tarnawsky (b. 1934), she expanded her writing to embrace works in Ukrainian, including poetry. After working at Reader's Digest, she published her first novel, The Last Centennial, in 1971. It was not a success, although it garnered positive reviews. Her second novel, The Front Runner two years later, was a publishing sensation, selling more than 10 million copies (try to imagine that these days, struggling writers!) and hitting The New York TimesBest Seller list, the first gay novel to do so. Warren had been a trailblazing female runner (she ran unofficially in the Boston Marathon in 1969), and used her knowledge of the sport to bring to life the story of a gay coach attempting to ready an out gay track star for possible Olympic glory, all the while suppressing his love and lust for his charge. Charged it was, a sizzling love story that captivated readers and made many gay readers feel validated. She came out as a lesbian the year her novel made its splash. Over time, film adaptations of The Front Runner were frequently discussed, though none came to pass. It was probably too soon when the book was hot, and then too late when the book was not. Paul Newman and Martin Sheen were mentioned as possible stars who could have played the coach. Warren went on to write two sequels to her most famous work and several other novels, all self-published by her Wildcat Press since the '90s. She was a prominent LGBTQ activist from the '90s on, and ran for WeHo City Council in 2006, losing in the end. Warren, who never tired of supporting LGBTQ people and speaking out whenever possible to lend us encouragement, was also quite a cook. In all, she published eight novels (The Last Centennial, 1971; The Front Runner, 1974; The Fancy Dancer, 1976; The Beauty Queen, 1978; One Is the Sun, 1991; Harlan's Race, 1994; Billy's Boy, 1997; The WildMan, 2001), a memoir (My West: Personal Writings on the American West, 2011) and four works of poetry (A Tragedy of Bees, 1959; Legends and Dreams, 1962; Rose-Hued Cities, 1966; Horse with a Green Vinyl Mane, 1970).